We had written about this issue, earlier this month. At that point of time, the currency in circulation was approaching its pre-demonetisation level. As of March 9, 2018, the currency in circulation crossed its pre-demonetisation level, for the first time. This is a significant event, which has largely gone unreported in the mainstream media. We wonder why? Dear Reader, guess you know the answer to this one. Figure 1: The currency in circulation as on November 4, 2016, four days before demonetisation was announced, had stood at Rs 17.98 lakh crore. After that the currency in circulation fell, as people deposited Rs 500 and Rs 1,000 notes in their bank accounts. It fell to low of Rs 8.98 lakh crore as on January 6, 2017, and has had largely had an upward trend since then. Of course, it is not fair to look at currency in circulation, just in isolation. Then there would be no difference between what passes of as analysis on the social media and us. The currency in circulation is also a function of the size of the economy. Between November 2016, when demonetisation happened and now, the economy has also increased in size. Hence, we need to adjust for this, and the right metric to look at is the currency in circulation to the Gross Domestic Product (GDP) ratio. In order to come up with this ratio for the end of this financial year, we will have to project the currency in circulation. A projection for the GDP is available. We basically look at the weekly growth rate of currency in circulation over the last one year (i.e. from March 10, 2017 to March 9, 2018). We ignore the rate of increase in currency in circulation from January 6, 2017 and March 2, 2017, because it was growing at a very fast rate at that point of time. Using the weekly rate of increase of currency in circulation from January 6, 2017, onwards, is likely to lead to a higher currency in circulation at the end of this financial year and we like to be slightly conservative in our calculations. Using the rate of weekly increase in currency in circulation between March 10, 2017 and March 9, 2018, the currency in circulation at the end of March 2018, is likely to be around 18.53 lakh crore. As of March 9, 2018, it was at 18.14 lakh crore. The GDP at the end of the year is projected to be at Rs 167.51 lakh crore. This means a currency to GDP ratio of 11.1%. Take a look at Figure 2, which basically plots, the currency to GDP ratio of the Indian economy, over the years. Figure 2: The currency in circulation as of March 31, 2017, had stood at 8.8% of the GDP. By March 31, 2018, it is expected to be at 11.1% of GDP, a jump of 230 basis points. One basis point is one hundredth of a percentage. While, this has still not crossed the pre-demonetisation level, it is a tremendous recovery from the March 2017 low. There are multiple interpretations that can be made from this. Firstly, it tells us very clearly that Indians have gone back to cash as a medium of exchange. It also tells us very clearly that fundamental habits cannot be changed overnight, a point we have been hammering away at for a while now. An economy which used cash for close to 98% of its transactions (in volume terms), cannot be suddenly expected to use substantially less cash. The increasing currency in circulation as a proportion of the GDP, is a sign of people carrying out more economic transactions with each other than they were in the past. Only when economic transactions happen do people need cash or currency to pay for stuff. If economic transactions are not happening, the currency can continue to stay in the bank account. Only, when transactions start to happen, money is withdrawn from banks and currency in circulation goes up. Of course, many transactions are carried out in cash. Informal economy forms a huge part of India’s total economy. It also employs a major part of the workforce. Depending on which estimate you want to believe the informal economy forms around 40-45% of India’s economy and employs anywhere between two-thirds to 92% of its workforce. The currency in circulation going up is clearly good news for the informal sector. It shows that life seems to be gradually getting back to normal, for this sector, which was badly hit in the aftermath of demonetisation. This should gradually translate into good news for the formal sector as well. If the informal sector does well and people working in it earn money and spend it, the firms operating in the formal sector are bound to benefit, as well. Of course, the propaganda these days is that everybody who operates in the informal sector is bad, because they don’t pay tax. But that is incorrect. As we have written in the past, a bulk of the individuals working in the sector do not come under the tax bracket and hence, they don’t pay tax. Hence, painting everyone with the same brush is neither fair nor required. Having said that, there are people and firms operating in the informal sector not paying their fair share of taxes. This means the income tax department needs more efficient targeting, instead of painting everyone with the same brush, as the government has been doing since November 2016. But that is easier said than done. Propaganda is way easier than doing the right things. The column originally appeared on Equitymaster on March 22,2018. 1) What is the source for this data? This isn’t exactly a conversation between two property dealers, or two prospective real estate buyers, who can quote any offhand numbers, while having a conversation. This is a statement being made by someone who was at the top of an economic institution run by the Indian government. This is a statement by an economist working in a top university in the United States. Also, if real estate prices have fallen by 25 per cent after demonetisation, why isn’t this visible in official data sources. Take the case of Reserve Bank of India’s All India House Price Index, which has been plotted as Figure 1. Figure 1 clearly shows that housing prices across the country have been on their way up. There has “clearly” been no dip, as Dr Panagariya claims. How do things look if we plot one-year return instead of index values? Let’s take a look at Figure 2, which does that. Figure 2 tells us clearly that the one-year return in real estate has been falling over the last six and a half years. This trend started much before demonetisation took place. Also, how have the returns been post demonetisation? Between the end of December 2016 and June 2017 (the latest data available), real estate prices as per the All India House Price Index have gone up by 4.3 per cent. The returns between September 2016 and June 2017, have been 6.9 per cent. Other than RBI’s All India House Price Index, there is NHB’s Residex. As of now this index has data only up to March 2017. And the one year median return between March 2016 and March 2017, as per this index, across 49 cities, was 2.8 per cent. This is very low. But where is the 25 per cent fall that Dr Panagariya has written about? 2) For a moment let’s assume that Dr Panagariya is right and real estate prices have fallen by 25 per cent. If real estate price all across the country have fallen by 25 per cent on an average, then there will be cities/town/localities where the price has fallen by more than 25 per cent. Which are these places? Can Dr Panagariya provide us with a list? This would make for a super investment right now. Let’s say there is this town where real estate prices have fallen by 50 per cent post demonetisation. It is worth remembering that a 50 per cent loss wipes off a 100 per gain. (If the price of an asset moves from Rs 50 to Rs 100 that makes for a 100 per cent gain. When it falls back to Rs 50 that is a 50 per cent loss). If there exists such a town, it would make for a great real estate investment right now. Can Dr Panagariya provide us with names of a few such places? 3) Also, if prices have fallen by 25 per cent, why are real estate transactions not happening? Why has the total number of unsold homes of real estate companies, only continued to grow? It is worth remembering here that a 25 per cent fall within a time period of a year, is a huge fall. Falls like these in case of real estate, only happen once in a few decades. And if something like this has happened, as Dr Panagariya claims, then why aren’t people buying? Interest rates on home loans have also fallen post demonetisation. Take a look at Figure 3. It plots the growth in home loans outstanding with banks. Figure 3 clearly shows that the growth in home loans outstanding has fallen post demonetisation. What this means is that people are not buying as many homes as they were in the past. If prices have fallen by 25 per cent post demonetisation, people would have bought homes and the curve in Figure 3 would slope upwards i.e. people would take on more and more home loans to buy homes. 4) Further, if real estate prices have fallen by 25 per cent, as claimed by Dr Panagariya, it is time that the state governments cut the ready reckoner rates on which stamp duty needs to be paid, by a similar proportion. This should be fairly easy given that BJP governments govern most of the big states across India and a direction from the PMO should be suffice to get them to do the needful. But nothing of that sort has happened. Why hasn’t this been done till date, is a question that only Dr Panagariya can answer. 5) To conclude, it is safe to say that Dr Panagariya has just made up this data, in order to justify demonetisation. It’s a sad day today, when an Indian economist, working in one of the best American universities has had to fudge data in order to please his former political bosses. The irony is that Dr Panagariya is no longer a part of the government. And he doesn’t really need to say things which do not hold up against data, unless, he is looking for another stint with the Modi government. That changes things. The column originally appeared on November 13, 2017. It has been one year since that fateful day last year, when prime minister Narendra Modi, suddenly announced that Rs 500 and Rs 1,000 notes, would be useless, in a matter of few hours. Modi was lauded for this “brave” decision. In a country, where politicians do not like to take decisions, here was one politician who had decided to make one. The trouble is that nobody told us on what basis had the decision been taken. Every decision, has consequences, especially a decision as disruptive as demonetisation turned out to be. And given this, there has to be some logic behind why the decision was made in the first place. It doesn’t take rocket science to understand that if 86.4 per cent of the currency in circulation is made useless overnight, in a country where 80-98 per cent of the transactions happen in cash (depending on which estimate you would like to believe), the buying and selling of things is bound to crash. When economic transactions crash, it leads to a slowdown of the overall economy, which is precisely what happened in India. This happened because agricultural markets in India operated in cash and with no cash around, the farmers were in no position to sell what they had produced. The onion market in Lasalgaon (near Nashik, and India’s largest onion market) continues to face this problem, a year later. Many informal markets crashed in the aftermath of demonetisation and haven’t been able to revive again. The growth of the non-government part of the economy, which forms close to 90 per cent of the economy, for the period April to June 2017, fell to a little over 4 per cent, in the aftermath of demonetisation. On top of that the total amount of deposits with banks increased dramatically and because of that the interest rates crashed. This hurt many people (especially senior citizens) who depend on interest from deposits for their survival. It also hurt those who use fixed deposits to save for the long-term. At the same time, the fall in interest rates did not lead to an increase in bank lending. In fact, bank lending in the aftermath of demonetisation has crashed. Meghwal passed the buck on to the Reserve Bank of India (RBI). A Right to Information query was filed with the RBI by a correspondent of the Press Trust of India (PTI). In the query, the central bank was asked to provide the minutes of the meeting in which the decision to demonetise Rs500 and Rs1,000 notes was taken. Over and above this, it was also asked to share its correspondence with the Prime Minister’s Office (PMO) and the Finance Ministry, on the issue of demonetisation. Basically, the RBI refused to answer the RTI query. And a year later, we still don’t know on what basis was demonetisation carried out. The column originally appeared in the Bangalore Mirror on November 8, 2017. In a few days, the first anniversary of demonetisation will be here. The Narendra Modi government will continue doing what it has done in the last one year—give demonetisation a positive spin. But how can a decision which made 86.4 per cent of the currency in circulation, useless overnight, in a country where 80-98 per cent of the transactions were carried out in cash (depending on which estimate you would like to believe), be a positive one? Let’s take a look at Figure 1. It basically plots the annual growth in non-oil non-gold non-silver imports. What does Figure 1 tell us? First, it tells us that the annual growth in non-oil non-gold non-silver imports had been rather subdued since January 2015. In fact, it has been in the negative territory several times, especially in a few months before November 2016, when demonetisation was announced. 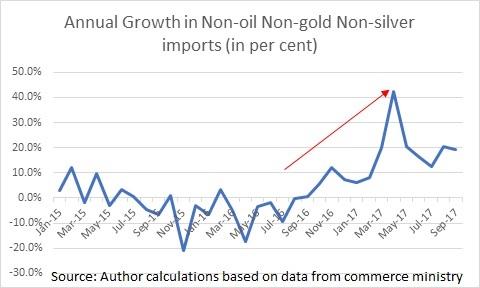 But after November 2016, the growth in non-oil non-gold non-silver imports simply took off and reached a peak of 42.5 per cent in April 2017. This basically means that these imports where 42.5 per cent higher in April 2017 in comparison to April 2016. What does this tell us? It tells us that a significant portion of the consumer demand post demonetisation has been fulfilled through higher imports. So far so good. Demonetisation basically disrupted and destroyed supply chains, both in the formal as well as the informal economy. With supply chains being destroyed, the supply of domestic goods has been replaced by imports and has not been fulfilled through the production of domestic firms. It is worth remembering here that imports are a negative entry into the gross domestic product (GDP) formula. Hence, if imports grow at a faster pace than exports, they pull down the GDP to that extent. Exports during this year (between April to September) have gone up by around 10.9 per cent in comparison to last year. Imports are up by 22.3 per cent. Given this, it is not surprising that the economy has slowed down. The economic growth for the non-government part of the economy, which forms around 90 per cent of the economy, was around 4.3 per cent, for the period between April to June 2017. This was more than 9 per cent in early 2016. Hence, demonetisation has played a huge role in slowing down economic growth. And this is tragic given that one million Indians are entering the workforce every month. In fact, it has also rendered a standard tactic in reviving economic growth, pretty much useless. Allow me to explain. When countries are not doing well on the economic front, the standard prescription offered by economists is for the government to spend more. When the government spends more, the extra spending becomes somebody’s income. When that income is spent, businesses benefit, and the economy revives. The trouble is that in the current situation if such a prescription is applied on India (actually to some extent it already has been), the government spending will eventually create consumer demand, a substantial portion of which will be fulfilled through imports. Imports, as we have already seen, are a negative entry into the GDP formula. Given this, a fiscal expansion instead (the act of government spending more) of creating faster economic growth might just slow it down. The point being that we aren’t done yet with the negative effects of demonetisation. There’s more to come. The column originally appeared on Firstpost on November 3, 2017. IDBI Bank is the worst performing public sector bank when it comes to its gross non-performing advances or bad loans. Bad loans are essentially loans in which the repayment from a borrower has been due for 90 days or more. As on September 30, 2017, the bad loans rate of the bank stood at 24.98 per cent. This basically means that the borrowers have defaulted on nearly one-fourth of the loans given by the bank. Now take a look at Figure 1. It plots the bad loans of IDBI Bank over the last three years. The bad loans rate of IDBI Bank has jumped from around 5 per cent to around 25 per cent, over a period of just three years. What is happening here? What this tells us is that initially the bank did not recognise bad loans as bad loans. It probably did that by restructuring loans (i.e. giving the borrowers more time to repay or decreasing their interest rate or by simply postponing their repayment) or by issuing fresh loans to borrowers in a weak position, so that they could repay the loans that were maturing. In the process, the recognition of bad loans as bad loans was avoided. Of course, any bank can’t perpetually keep kicking the can down the road, and after a point of time must do the right thing. IDBI Bank is now doing the right thing of recognising bad loans as bad loans and given this it has such a high bad loans rate. Given that, one-fourth of the loans advanced by the bank have been defaulted on, it is worth asking whether this bank should be in the business of banking at all. Nevertheless, the more important issue here is how do depositors view this bank. The best way to find this out is to look at the total amount of deposits the bank still has. Take a look at Figure 2, which plots that. What does Figure 2 tell us? The total deposits of the bank have fallen after peaking in December 2016. Nevertheless, the total deposits with IDBI Bank are still higher than they were three years back. Hence, the conclusion that we can draw here is that while bad loans of the bank have gone up from 5 per cent to 25 per cent over a period of three years, the total deposits with the bank are still at the level they were. Why is this the case? Why would you continue banking with such a bank? First and foremost, this faith comes from the great faith in the government. The government will not allow any bank to go bust. Fair enough. But why wait for that to happen? Typically, when a bank lands up in major trouble, the government tends to merge it with a bigger bank and thus the depositors continue to be safe. Nevertheless, such a merger is never smooth and there might be a brief time period when the full money deposited in the bank cannot be withdrawn. Hence, liquidity can become an issue. Also, it is worth remembering here that IDBI Bank is not a small bank. It is a relatively big bank and had total assets of close to Rs 3,61,768 crore, as on March 31, 2017. This means that if the government were to decide to merge it with another bank, the balance sheet and the profit and loss account of the combined entity, will be another big mess. Secondly, many people are simply unaware of how badly the bank is placed. This lack of knowledge about their financial activities is a general trend among many people in this country. We spend more time gossiping and worrying about the state of the nation, than the state of our own finances. Thirdly, many people locked in their fixed deposits at high interest rates, a few years back. In the aftermath of demonetisation, interest rates have crashed as banks have been flush with funds that were deposited and at the same time their lending has crashed. Given this, even if some individuals understand the riskiness of the situation, they really can’t do much about it. In case they were to break their fixed deposits and move it to other banks, they would earn a much lower rate of interest. And at that lower rate of interest, they would simply not be in a situation to meet their monthly expenses. This is another negative impact of demonetisation at play, with people having to continue to bank with risky public sector banks, which includes IDBI Bank. While, some people are simply stuck with IDBI Bank, there are others who can easily move their money to other public sector banks, like State Bank of India, Vijaya Bank, Indian Bank, Syndicate Bank etc., which are in a comparatively much better position. But given that they have chosen not to, they are the real brave-hearts. The column originally appeared on November 6, 2017. The ill-effects of demonetisation are still coming to the fore. In this issue of the Diary, I will talk about how demonetisation destroyed Indian jobs and “possibly” helped create jobs abroad. Before I get into explaining why I am saying what I am saying, a recap of some basic economics is necessary here. The point to remember here is that imports are a negative entry in the GDP formula. The more a country imports, its GDP falls to that extent. Having said that imports also represent consumer demand at the end of the day, even though that demand does not add to the country’s GDP. For example, every time an Indian buys an electronic good manufactured in China, he is adding to the consumer demand but not to the GDP. Of course, he is adding to the Chinese GDP because exports are a positive entry into the GDP formula. Hence, if we remove the imports of oil, gold and silver, from the total imports number (in dollars), what remains (i.e. non-oil non-gold non-silver imports) is a good indicator of consumer demand. Now let’s take a look at Figure 1, which basically plots the year on year growth in the monthly non-oil non-gold non-silver imports. Hence, the non-oil non-gold non-silver imports in April 2017 went up by 42.5 per cent in comparison to the imports in April 2016. And that’s how it is for all other data points in Figure 1. What does Figure 1 tell us? It tells that non-oil non-gold non-silver imports have grown at an extremely fast rate after October 2016. They are growing at rates at which they haven’t grown for a couple of years. What is happening here? This basically means that demonetisation destroyed domestic supply chains. Without supply chains products can’t move. This has resulted in consumer demand being fulfilled through imports. This is clearly visible in the huge growth of non-oil non-gold non-silver imports. What this also means is that as demonetisation destroyed supply chains in India, it also led to a huge job destruction. If goods weren’t moving, there was no point in producing them either. This meant shutdown of firms and massive job losses. Further, by importing stuff that we used to produce in India earlier, we have helped the manufacturing business in foreign countries and in the process “possibly” helped create jobs there. The irony is that one million youth are entering the workforce in India, every month. The economist Kaushik Basu had said in November 2016 that “[The] economics [of demonetisation] is complex & the collateral damage is likely to far outstrip the benefits.”The impact of this complex economics is still playing out and along with the botched up implementation of GST, has pulled down non-government GDP growth to around 4.3 per cent. The column was originally published on Equitymaster on September 26, 2017. On August 30, 2017, the Reserve Bank of India (RBI), published its much-anticipated Annual Report. Up until last year, only journalists who covered the banking beat, economists and analysts, kept track of the RBI Annual Report. But this year, many more people were interested. This was primarily because the Annual Report would finally reveal what portion of the demonetised Rs 500 and Rs 1,000 notes, made it back to the banks. And why was this of interest? After demonetisation had been announced, many people including government ministers and several leading economists, had hoped that a large portion of the demonetised notes won’t come back to the banks. This was because those who had black money in the form of cash wouldn’t want to deposit it into banks, and reveal who they are to the government. In the process, a lot of black money held in the form of cash would be destroyed. But nothing of that sort happened. The RBI Annual Report revealed that Rs 15.28 lakh crore of the Rs 15.44 lakh crore that was demonetised, made it back into the banks. This meant that nearly 99 per cent of demonetised notes made it back to the banks, and almost no black money was destroyed. Other than not achieving its major goal of destroying black money, demonetisation has also hurt India’s economic growth in general and manufacturing and industrial growth in particular, very badly. What does this even mean? If paper money is made useless overnight, it is bound to come back to the banks. Where else will it go? Another reason offered to show demonetisation as a success is that Rs 3 lakh crore of the Rs 15.28 lakh crore that has come back is black money. No explanations have been offered on how the Rs 3 lakh crore number was arrived on. But even if we assume that it is black money, the holders of this black money aren’t exactly waiting to hand it over to the government. They have access to chartered accountants as well as lawyers and are ready for a long-drawn battle, if needed. This is one explanation for the rather weak defence of demonetisation that is still being put out by the government. Then there is the problem of the narrative, or the prevailing interpretation of a pattern of events. There is a section of population which really wants to believe that demonetisation worked. It’s their narrative. And that explains why the weak spin on demonetisation is still going strong. The column originally appeared in the Bangalore Mirror on September 20, 2017.